In what was billed by the media as the next “Game of the Century”, Michigan unfortunately fell flat yet again, losing to head coach Urban Meyer’s Buckeyes for the fifth consecutive year. The overtime loss — a first for the series — eliminated the Wolverines from competing for the Big Ten title, and all but removed any chances of making the College Football Playoff. As a fan, a myriad of emotions ran through my head as waves of scarlet and grey cascaded upon the field following the loss. Beyond anger and sheer disappointment, I thought to myself: what do we do now? First and foremost, what we do not, and quite frankly should not do, is blame the officiating crew. Such a proposition is even difficult for me to follow through with, as throughout the contest it appeared a number of calls were clearly not in Michigan’s favor, particularly a controversial fourth down play that, despite what could have ended the game with a Wolverine victory, kept the drive and the contest alive for Ohio State. Although it is remarkably easy to shift the focus of our derisive scorns against the men adorned in stripes, it is incredibly short-sighted to believe the officiating crew was entirely to blame. While it may be a hard pill to swallow for some, Michigan made mistakes, and quite a few of them. To begin the first half, Michigan thoroughly outplayed the Buckeyes in nearly all aspects of the game, crafting methodical scoring drives and executing near-flawless special teams play while keeping opposing quarterback J.T. Barrett from accomplishing anything on offense. Despite these valiant efforts, turnovers kept Ohio State in contention for most of the contest, preventing Michigan from putting the game away early. Who bears the brunt of responsibility for these turnovers? Unfortunately, the blame rests solidly upon the shoulders — or collarbone, to be more accurate — of Wilton Speight. Speight’s two interceptions, including one returned for a touchdown, resulted in a whopping fourteen points for the Buckeyes. In fact, those fourteen points were the only points scored by Ohio State in the first half. Additionally, with the Wolverines on the goal line looking to score a critical go-ahead touchdown, Speight again missed his mark, fumbling the snap and essentially handing the Buckeyes the football. Beyond turnovers, Speight routinely missed his mark, throwing behind his receivers and failing to spark any sense of consistency on offense in the second half. To his credit, coming off of a purported broken collarbone is no easy task; I certainly wouldn’t be out on that field. However, Speight’s inconsistencies under center did no favors for the Wolverines. Speaking to inconsistencies, Michigan as a whole committed multiple costly mistakes and crucial moments in the game, again allowing Ohio State to creep its way back into contention. Overall, the Wolverines were called for seven penalties, amounting to 59 yards, whereas the Buckeyes only earned two penalties for a measly six yards. Most notably was a fifteen yard unsportsmanlike conduct penalty against coach Jim Harbaugh for throwing his headset in anger after an off-sides call. 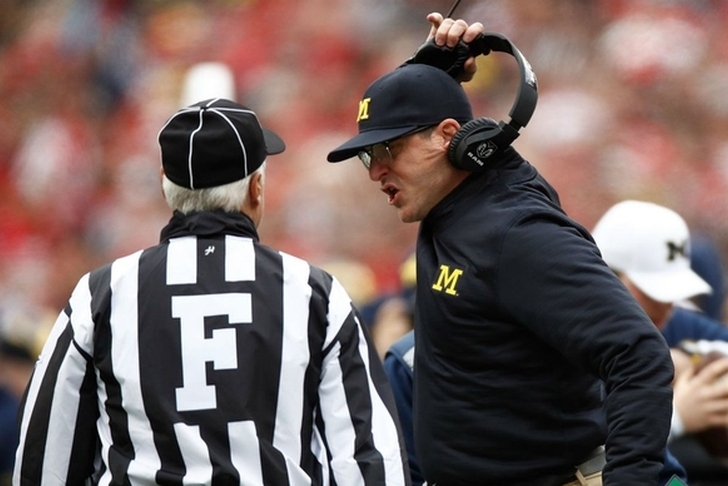 While watching Harbaugh angry on the sidelines might be entertaining for some, it embodies a lack of collective discipline that keeps outmatched opponents within striking distance. Fans and analysts alike can debate what went wrong in last Saturday’s match up as long as they’d like; however, dwelling in the past helps nobody. Michigan faithful, now a long-shot at earning a playoff berth, must find something to be happy about. The question is, what should that be? As hard as it is to admit, the answer lies in the Big Ten Conference itself. This season marks the first year since 1960 that four Big Ten teams were ranked in the top ten of the Associated Press poll. In particular, Penn State seems to have returned to full form following years of mediocrity in the wake of the Jerry Sandusky scandals of 2011. Simply put, though Michigan may not be on top, the Big Ten is back and better than ever. At first, many fans may scoff at the idea of feeling pride toward their conference, believing it to be irrelevant in the grand scheme of things. This view is, quite simply, ignorant. A strong and competitive Big Ten provides a plethora of benefits to Michigan, as well as the other thirteen members. Most apparent of these benefits is an increase in “Strength of Schedule” metrics. In a narrow sense, playing better teams on a consistent basis makes for a more compelling case to reach the Playoff, and can even excuse losses when comparing against other out of conference teams. Look at Western Michigan, who remain the only undefeated team in FBS play besides Alabama. While they remain undefeated, they currently only rank thirteenth in the latest AP poll. Why? Because their highest quality win comes against Northwestern — a team that finished 6-6 this season. In comparison, Michigan has beaten four teams ranked in the AP poll at one point during the season, making those wins far more convincing and valuable. Even wins against unranked Big Ten foes are far more valuable when the conference as a whole is at its best. Following a slow start against Indiana, I overheard many fans arguing it was “sad” the game was closely contested, insinuating the Hoosiers — a team with ten bowl appearances — was somehow beneath our consideration. On the contrary, I was actually overjoyed the game was close, for the same reasons mentioned before. Having better in-conference competition makes Michigan wins seem more convincing, especially when trying to draw comparisons between conferences. Playing a weak schedule convinces nobody, and draws attention away from both Michigan and its fellow conference members. Moving forward, Michigan will need a miracle to reach the College Football Playoff. Currently ranked 5th in the latest AP Poll, it appears the Wolverines will still reach a New Year’s Six bowl game, most likely the Orange Bowl against Louisville according to SB Nation. However, commentator Kirk Herbstreit asserts Wolverine fans still have something to hope for. “If Colorado beats Washington, I think Ohio State AND Michigan both make the playoff”, Herbstreit argued on ESPN’s Mike and Mike radio show. As the season nears its inevitable conclusion, Michigan can’t help but feel a sense of disappointment. In a way, the season felt almost scripted to be our year, the year Harbaugh finally alleviated the pain of a five year losing streak against the Buckeyes and sent us to the Playoff. Such melancholy is wasted effort; fans must continue to be supportive of their team and its accomplishments. Think about it: being the fifth best team out of 128 in the FBS is still remarkable. Furthermore, only the strongest of fans can express humility, and hope for the best for the conference. Rather than remaining bitter towards the officiating or angry at the circumstances, Michigan fans should remain proud of both their team and their conference’s achievements, and hope for the Big Ten to become even more competitive and exciting as the years go by. And, at the very least, there’s always next year. We at the Review express our deepest condolences for the victims of the recent attacks on The Ohio State University’s campus. We sincerely hope for the safety of the campus community, and extend our warmest regards for the families affected by this tragedy. This is a great article Jake! Keep up the great work. Everyone loves your opinions and is super interested in everything you have to say! !